Box Dimensions (LxWxH) 11.6 x 10.2 x 8.8"
650W Plus Tungsten Fresnel (120-240 VAC) is rated 4.7 out of 5 by 64. Rated 5 out of 5 by Duane Lokitis from Great lighting at a great price! Out of the box, I had the bulb installed, the light mounted and made all adjustments in less than 5 minutes. Very lightweight and simple to use, this light is ready to go at a moments notice. When you add a set of barn doors and a scrim or two, you can instantly change the shape and intensity of the light. I use 2 of these lights to video tape slide show presentations. I'm able to focus the light with a few simple turns and use the barn doors to control the shape of the light so my subject is very well lit and the slide show is not effected by the light at all! Because they are so lightweight, it's very easy to carry both light stands and lights in one case. Rated 5 out of 5 by Lightsong Studio from Excellent light - well worth the money I have four of these lights and use them for Classic Hollywood type glamour and figure studies. I use them with dimmers to control the amount of light that they emit and keep the models comfortable. The ability to focus the light is a big plus and of course with continuous lighting WYSIWYG. The lights do get hot but once you understand that there are two cool places where you can grab them you'll have no burn issues. I use them with the barndoors and snoots when needed and these accessories are well integrated and attach easily to the light fixture. The AC cord is about 20' long. Rated 5 out of 5 by Matt Luttmer from Perfect light This light has a special quality about it. I use this light for still photography and could not be more please with the results. My images have an old Hollywood look to them that just can't be achieved with a strobe. The Fresnel lens adds a certain luminescence to images that is unbelievably beautiful to my eye. I use it with the barn doors and a dimmer. With the dimmer the color temp will get slightly warmer as you dim so if color is important to you keep this in mind. You will also need to use a correcting gel with this light if you are shooting under mixed conditions. Rated 5 out of 5 by Mikey from Beautiful Perfection The 650 Plus is a beautifully designed light, very functional, light weight, easy adjustment from spot to flood. For video lighting I would not own any other fresnel light. The barn doors are excellent also. About ready to order another 650 Plus. The light comes with a nice long, very high quality and very flexible power cord. Personally, I would like the light to have a power socket on it or a short pigtail so the light and cord could be stowed separately. Like most items relating to film and video, the price point is much too high. Like they say, Quality Costs I guess. Rated 5 out of 5 by Michael Crommett from Still One of the Most Versitile Lights The Arri 650 fresnel certainly isn't the latest technology. In fact, fresnel lenses are a 19th Century invention. 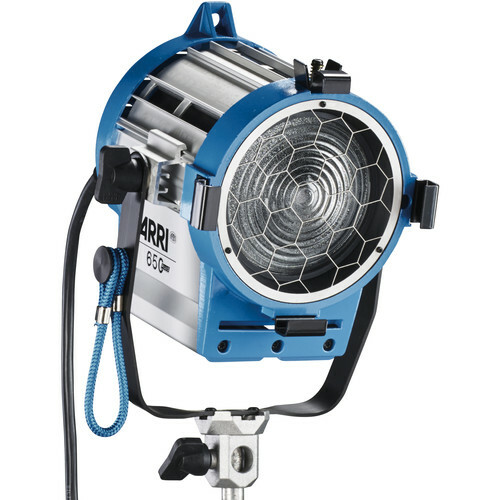 That being said the engineers at Arri have made this light a pleasure to use and maintain. First of all is bulb installation. Just pop the top off and put the bulb in place. The second is rewiring it. The screw down wiring system works every time and is much better than comparable LTM or Mole systems. Then there's the light quality which has a nice throw, is as even as a fresnel gets, mostly pleasant shadows, and a nice heatsink design which reduces heat problems. I have used this light twice already in a week's time and I am sure it will see battle again soon! Rated 5 out of 5 by Anonymous from Great Light for Photographers The traditional lighting that grace every TV or film set also has potential to act as light sources for stills & portraits as well. The concentric glass rings on the outside of the lens and slight dimpled surface on the inside helps to scatter any chromatic aberration. The result: The look of the light it produces is one of beautifully smooth transitions, from the hot spot to the unlit zone. If you are mixing daylight with tungsten, then you need to use color correction gel on a filter frame. Rated 4 out of 5 by Christian S. from Great workhorse light These are great lights. Convenient spot/flood combined with barndoors and accessories allow for a good amount of control. Fresnel lens provides even consistent source at the same time protecting against lamp failure. In older models the spring holding the barndoor clamp at the top has started to loosen. Without replacing the spring, the barndoors are not safely held in place and had to be secured through additional means. When the light is hot the lamp is highly subject to failure which can be irritating and expensive. While working with these, the slightest jolt can (and has) cause lamp failure. More an issue with tungsten lights in general than this particular model.